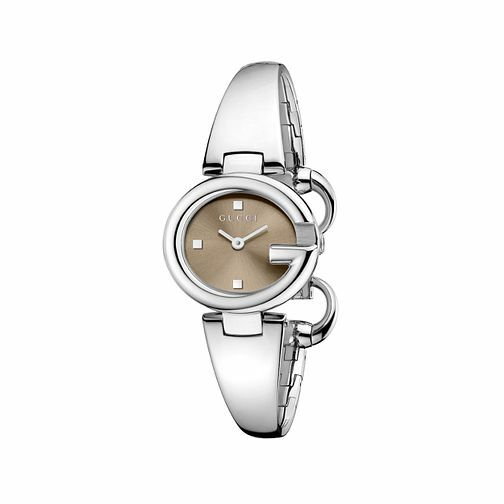 Celebrated Italian fashion label Gucci deliver sleek, sophisticated style with this small ladies' half bangle watch. Made from polished stainless steel, the oval case features a G shaping and is set with a simple brown sunray dial. Versatile and modern, this watch is perfect for all occasions. Gucci Guccisima small stainless steel bangle watch is rated 5.0 out of 5 by 2. Rated 5 out of 5 by Anonymous from Small and classy watch. Beautifully designed and perfectly compliments special occasions. Bought as a gift with the gift card option which was a waste of money. Overall delighted with the watch. Rated 5 out of 5 by Anonymous from Simply beautiful Stunning watch...the small version fits perfectly!